Chiefly English, with some French and Spanish. Edited by the faculty and graduate students of the English Dept., University of Puerto Rico. Some issues have also distinctive titles. essays, interviews, and some short stories and poems. people of the Caribbean and/or about the Caribbean. language, and culture accessible to non-specialists. studies should conform to the style of the MLA Handbook. to thirty lines. All correspondence must include S.A.S.E. Search Associates, and Professor Alma Simounet de G6igel. to consider more submissions from scholars and critics. Administration deserve special mention as well. Puerto Rican municipality used by the U. S.
award in the same year it was published. this in? It's your decision. RLM: The interview will eventually be in English. So if you want to do it in English . .
PJS: I hate translators. I'll do it in English. RLM: We'll start with the first question then. dences. That has nothing to do with influences. concerned, and I did migration and all that. we share together in the islands. something which I've always aspired to do. him too. I don't give a damn. 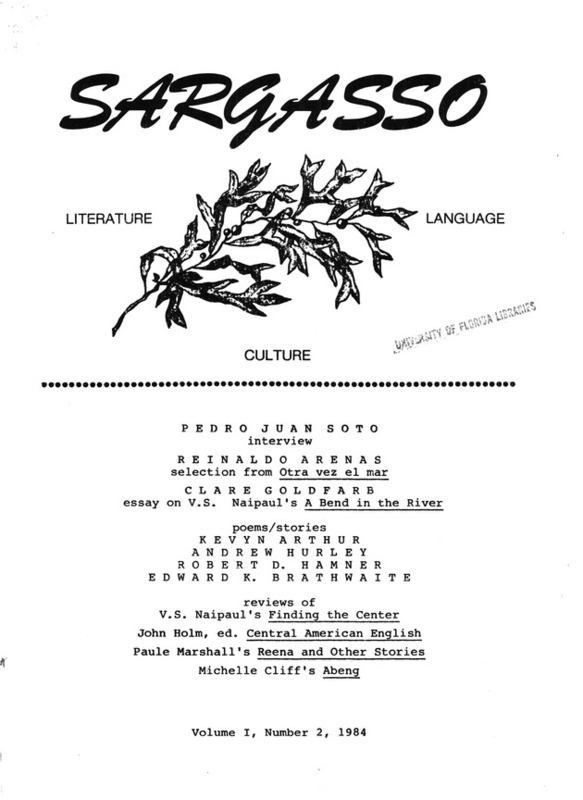 RLM: Have you stolen from Puerto Rican literature? no talent as a thief. of New York. Spiks  is an impressive . .
RLM: But you said you found violence in New York. You hadn't experienced violence in Puerto Rico? you are going to convey something in exchange. you returned from New York? order to divert the attention of the reader. subject--they keep being Puerto Rican. RLM: Let's return to the experience of violence. about a violence that is learned in New York. are generating our own violence. PJS: Oh, of course, of course. that emerges from the homeland? be it essay, be it novel, short stories, plays. LF: But you're a gentle man, easy to talk to . .
RLM: . and sometimes you're not so gentle . .
finished yet, of the author being an actor. that has become theater, which is Spiks. RLM: Why don't you write more theater? man. I do things by myself through writing. right, not the primary right. my experience is different from your's. Doesn't that negate your arguments? might do it for money. I won't do it, ever. I have to believe in it. RLM: But you have written for the theater. Why? left. The only thing is the "moves" [la movida]. next festival." They never listened to me. company]. I never saw it. I read the scripts. first of all, I demand that from myself. Then I can demand it from others. fiction and reality in everything you do. you decide when you are writing? know, if it's good or it's bad. with them a lot and hear their complaints. after all, have to be sort of an echo chamber. damn writer is always writing only one book. of another book. But it's the same old book. there. There's also violence in Usmall. .
that pushes you into killing yourself . .
have many critics saying, "Oh, Puerto Ricans,"
system, and they are sometimes too obvious." again. How you do it, depends on talent. and died after they surrended to police. them at the end. I'm struggling with that. body else should do it. I say, why the hell? me from being challenged by it. taneously; that does not exclude the other. with these vistas [hearings] on television. three hundred is pretty obsolete. Puerto Rican and Caribbean writers? PJS: Oh, yes, no, no, no . .
RLM: . and he's justifiable as a character. PJS: . you can deal with characters like that. RLM: Not with human beings? people." I don't know how you can do that. wind, that I'm not reaching my own people. there before. We've suffered that before. are new things that I wish I could deal with. have had no aid as far as that's concerned. Rican workers in the theater and in the movies. self more in terms of the Hispanic tradition? can be as universal as the rest of the world. to pages and letters, dead hours, moments of respite. splendid, and stereotypical human condition. of the intimate of Herodotus. tried to allay their uncertainty? by men who loathe the place that is? (gaily) drags towards the ocean. affliction would change us into loathsome sages. One lives, but for what? to stand in that line. a young man's drowned body. to be able to sail across that ocean. who stands there smiling, licorice-stick in hand. become involved with the text to varying degrees. narrators are more obsessed with their experiences. to the children at Bly. Neither will the governess. Narrators tell us what they know, what they surmise. ful narrative may have to take an interrogative form. General Mobutu which Naipaul draws in that Congo essay. river, something like Conrad's fantasy came to pass. Stanleyville led to a reign of terror. rather than what he is. their tradition; insecurity, their security. world which will never welcome all its inhabitants. by the British of stamps depicting local African scenes. region, not something that is part of his own experience. goal is "not to be good . but to make good"
Salim predicts, oblivious to its inevitable destruction. define a home in the town at the bend in the river. bush, an outpost before the jungle heart of the land. with a dream of being or doing good in some village. his own vision of success. of the hidden cache of ivory in Salim's yard. these young men who involve themselves in his life. him about a marginal life in an insecure world. lamplight is different from the house under sunlight. for Yvette explodes in a scene of physical violence. narrates Naipaul's short story, "One Out of Many." among experiences and people he cannot comprehend. man I know" (p. 22). storieshe hears force him to make another decision. Salim decides to turn his back on Africa. different from what he has known all his life. London; these people have "squashed themselves in"
be part of any life he chooses, in London or elsewhere. start, not in Africa, not in Europe, and not in America. The reader knows this, and so does Salim. the life he leaves behind. affairs so as "to make a fresh start somewhere else"
statement. The novel ends, as it began, with a journey. choose well, he at least makes a choice among places. Like Conrad's Marlowe, Salim has learned about Africa. ment which does not claim him as one of its own. situation. In his earlier work, "In A Free State,"
history also introduced his people to the lie (p. 16). Hotel as relief from his empty life. the stuff out of which they create narrative art. tales to tell; like Marlowe, Salim last speaks on a boat. to leave the battle-torn town. river's banks. The tall flower which is a "new thing"
this flower which he has written of several times. can foul the propellers of the steamer. flowers and insects are indigenous to the volatile land. who is a marginal figure among other marginal figures. country trapped and static, eternally vulnerable,"
must survive his experiences in order to tell a story. fringes of the civilized world. The Athlone Press, 1975), pp.155, 159. Peron (New York: Alfred A. Knopf, 1980), p. 215.
this edition will appear in parentheses in my text. State (New York: Alfred A. Knopf, 1971), p. 61. 10Naipaul, "A New King for the Congo," p. 199. W. W. Norton and Company, Inc., 1971), pp. 10, 12. 13Naipaul, "A New King for the Congo," p. 193. 16Conrad, Heart of Darkness, p. 79. Naipaul, "A New King for the Congo," p. 207. "(People are Continually asking one the way out)"
for 37 years until he finally dropped dead. a little fossilized sea urchin shell. where I hammered, making my mark. the rumbling sun has roll'd. to the bottom of the drum. in the bottom of a drum. they can't do anything with us or we'll shoot 'im." has that verb got to? world, of all worlds, one. and I had four stitches. time is that Pug loved to play but Red was getting old. ride him or anything. He was dignified, I'd say now. limbs slacken or tense as to action, literally strain. He peopled the night with act and emotion. once, long ago, be now, made now seem to last. Earning passage in measured regularity. To minutes reviving page by page. On canvas, strings, cowhide drum. Tasted the same in Adam's garden. Moonlight dancing at Ibo L6i6. Wave on wave, incremental benediction.
. sick sad and subtle . ing and reveals that perfect quattrocento patt. Finding the Center: Two Narratives. first published separately: "Prologue to an Autobiography"
"Prologue" is indeed a revelation and a confirmation. a starting point out of many-faceted life experiences. word: he is and has always been a "looker." palace, a university with an unknown number of students. chicken to be devoured by one of the waiting monsters. Heidelberg: Julius Gross Verlag, 1983.
trading outposts and buccaneers continued in the area. contact that each community has had with Spanish." possibly many more centuries--in Central America." mesolectal, and acrolectal varieties spoken in each area. it is possible to follow the texts easily. are little known to those who do not live in the areas. New York: Feminist Press, 1983.
latest book, Reena and Other Stories, a special treat. Timeless People, and extensively reshaped and rewritten." added their own personal touch to everything they said. women can be poets in their own right. frustration and hopelessness is what creates the "valley"
more dramatic life through their actions and dialogue. New York during the late forties and early fifties. grounds and of all ages and colors. first published in Soul Clap Hands and Sing (1961). and gives reasons for their behaving as they do. sense of desperation that engulfs them. youth and old age, between na'ivetd and sophistication. than a royal palm tree growing on her plot of land. possible the person she is. which the earlier novel renders more understandable. use her energy and creativity. New York: The Crossing Press, 1984.
for racial, historical, and personal self-definition. mythological and folkloric customs retained by islanders. certain parameters which clouded her judgment." both in the development of her novel. inconsistencies of narrative do not mar the book's worth. of a pathetic reality that hovers over much of the Caribbean. that Michelle Cliff's Abeng will be most appreciated. Reinaldo Arenas is a celebrated Cuban novelist and poet. lated by Andrew Hurley in 1985.
and narrative and teaches at Western Michigan University. Simmons University in Abilene, Texas. Latin American authors are widely acclaimed. and is an associate editor of Sargasso. University of Puerto and an associate editor of Sargasso. the University of Puerto Rico. de las Americas award for Fiction. Susan Homar: Luis Rafael Sanchez: Interview. Edward Kamau Brathwaite's Third World Poems ..